By Oscar Johnson, reporter for Smoke Signals, a publication of the Grand Ronde Tribe. From a special edition, Spring 1999. One day Crow entered the house of a poor family, according to an old Tualatin, Kalapuya story. He told the woman, "make and sharpen a stick at the end and dig a hole. Get these camas, and get these potatoes and get wild carrots, and all these edible things in the ground so that they may be eaten," because, he explained, "you will be well off." The Kalapuya tribes, once estimated to number as many as 10,000 strong, had a traditional lifestyle that was indeed "well off." They lived in the heart of the fertile Willamette Valley between the Coast Range Mountains and the Cascade Mountains. Their territories stretched from the winter villages of the Tualatin, once dotting the pristine landscape of the city that now bears their name, present day Forest Grove, Hillsboro and Beaverton; to the Yonkalla, who lived from just northeast of Roseburg to the Calapooia Mountains. The traditional lifestyle once enjoyed by Kalapuya peoples is perhaps: best expressed by John Hudson, a Santiam Kalapuya who once lived on the Grand Ronde Reservation. As the last known speaker of the Kalapuya language, he was a translator for Linguist, Melville Jacobs, who also interviewed him in detail about Kalapuya ways in 1928. "This country is not good now. Long, long ago it was good country. They were all Indians who lived in this countryside. Everything was good. No one labored (for wages). Only a man went hunting, he hunted all the time," reminisced Hudson. "Women always used to dig camas, and they gathered tarweed seeds. Such things are all we ate. They gathered acorns, they picked hazelnuts, they picked berries, they dried blackberries." Hudson's accounts of Kalapuya stories, culture and practice add much to what is known about this large family of more than a dozen Kalapuya tribes and bands spanning the Willamette Valley. By the turn of the century, the Tualatin (Wapato Lake), Yamhill, Ahantchuyuk (Pudding River), Luckiamute, Santiam, Mary's River Band (Chepenafa), Chemapho (Maddy Band), Tsankupi, Tsanchifin (McKenzie), Mohawk River, Chelemela (Long Tom River), Winnefelly and Yonkalla (Umpqua Kalapuya) were all Tribes who spoke one of three variations of the softer sounding Kalapuyan language. As a semi-nomadic peoples, the Kalapuya lived in permanent winter homes and migrated throughout the Willamette Valley during the warmer months. They traded regularly with their Molalla and Cayuse neighbors as well as other Northern California, Oregon coast and Columbia River tribes. 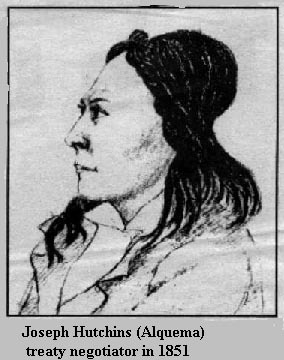 Hudson's reflections on the days when Kalapuya Country "was good country" point to what author and independent scholar of Northwest tribes, Henry Zenk, says is one of the Tribe's most unique aspects. "Their lifestyle -- the way made their economy. "They slash burned just to make the country an open pasture. To make the habitat more conducive to elk, deer, camas, tarweed and hazelnuts," says Zenk. "The way they managed their land is something they had to work at. They were almost like a pre-agricultural society." This rare pre-agricultural land management not only ensured that lush meadows would attract, game and produce traditional plant foods every spring. According to Hudson, "When they burned the land they burned the grasshoppers. And the women gathered up the grasshoppers, and they ate those grasshoppers, it is said." Similarly, Zenk adds that the freshly burnt fields left camas seeds loosened from their pods and ready for harvest. "The women would go out into the fields and use seed fan (baskets) to beat the seeds from the parched pods." Like camas, staple foods such as tarweed, Wapato, hazelnuts and acorns were harvested by women, cooked, sometimes ground then pressed into cakes and often stored for the lean winter months to come. By the early 19th century Tualatin winter villages each had communal tarweed fields which were portioned out to individual members. These northern Kalapuyas also marked the fall season with an annual community-wide Wapato harvest. But according to the Tualatin, Crow spoke not only to the woman of the house. He also had words of wisdom for the man. "Make an arrow and make a bow,' he said to the man. "Hunt in the woods! Kill deer! Kill elk! Kill black bear! Kill panther! Kill wildcat! Kill grizzly! Kill that kind of things! Eat the flesh! Make blankets from their hide, all sorts of things from their hide. Make yourselves wealthy people." Like other Willamette Valley tribes, the Kalapuya also relied on hunting for food, clothes and tools. In addition to following Crow's advice, Kalapuya tribes also used snares to trap small game, pitfalls to catch elk as well as spears and lures to fish for salmon, steelhead trout and eels. In the case of the Santiam, who lived just east of present day Albany towards the Cascades, hunters were known for circle hunting. The hunters worked as a team to surround the deer and drive them into an open spot before using their bows. Sometimes arrow tips were poisoned with rattle snake venom to ensure the kill. Hudson says it was also common for hunters to spread the wealth of the bunt by sharing "small pieces of the meat around amongst the people." In addition to tribes benefiting from the wealth of their well-managed environment, the Kalapuya economic system ensured that members from various tribes had individual wealth as well. Objects such as whale bone clubs, obsidian knives, camas root, antler digging sticks, tobacco and occasionally slaves were used as trade items to gain wealth as well as needed materials. However, long before non-Indians began to settle in the Willamette Valley, the Kalapuya tribes were among those who used dentailia and olivella shells harvested from the sea as money. "Long ago the people named their money. What they called their money, they always safeguarded well. They said whoever has a lot of money, he is a wealthy upperclass person. Should he wish a wife he could buy her quickly. And further should he want a slave, he could buy one quickly. Such a person had a lot of money," according to Hudson. "These people would be marked on one arm to measure the length of their valuable things. It is said that is how they did." The first recorded contact Kalapuya tribes had with whites was in 1812 when a party of Pacific Fur Company traders lead by Donald McKenzie traveled through the Willamette Valley. Although these friendly relations lasted about 30 years, it would not be long before the wealthy way of Kalapuya life became permanently altered. Between 1830 and 1833 a malaria plague swept through the Willamette Valley leaving behind only a fraction of the original Kalapuya population. And when tensions grew between Willamette Valley Indians and white settlers in the mid 1800s it would not be long before the Kalapuya would join the ranks of other treaty-signing tribes. 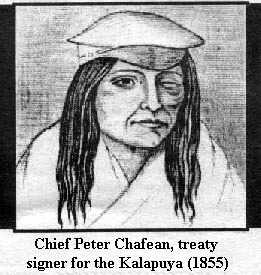 Chiefs and headmen of the Winnefelly, Mohawk River, Chapen, Tecopa, Santiam, Mary's River and Ahntchuyuk tribes and bands of Kalapuya signed the 1855 Dayton Treaty with Superintendent of Indian Affairs, Joel Palmer, according to treaty documents. Together with other neighboring Willamette Valley tribes, they ceded territory stretching from the Columbia River to the Calapooia Mountains between the coastal and Cascade mountain ranges. In exchange the U.S. government pledged four consecutive five-year annual payments to begin at $10,000 then $8,000, $6,500, and $5,500. An additional $50,000 was also thrown in to, among other things, "promote their well-being, advance them in civilization, (and) for their moral improvement and education...," the treaty says. The Dayton Treaty was similar to a November 1854 treaty at Calapooia Creek in Douglas County with the Kalapuya and Umpqua Tribes (ratified March 3, 1855) awarding $3,000, $2,300, $1,700 and $1,000 in the same five-year period increments. In both cases the money would be used for the benefit of tribes at the "discretion" of the U.S. President. "Now we will give you quantities of money, all sorts of things so then you will not be poor," assured Palmer in an 1855 address to the Santiam Kalapuya. Tribes were told that for the next five years they would be supplied with blankets, clothes, hats, sugar, flour, and ploughs. Cattle, horses, and wagons were also promised. Tribal members were guaranteed 20-acre plots of farmland and told the plots would be fenced and ploughed. A school, blacksmith shop, general store and individual homes would be built in exchange for the vast portions of the Willamette Valley they ceded and anything needing repair would be fixed at cost. Children would be taught to read and in 20 years they would live independently, "just like an American. "Whatever you may desire he (the U.S. President) will make it," Palmer's clerks recorded him as telling Kalapuya treaty signers. But before long, Kalapuya tribal leaders became disgruntled with what proved to be the hollow ring of half filled promises. 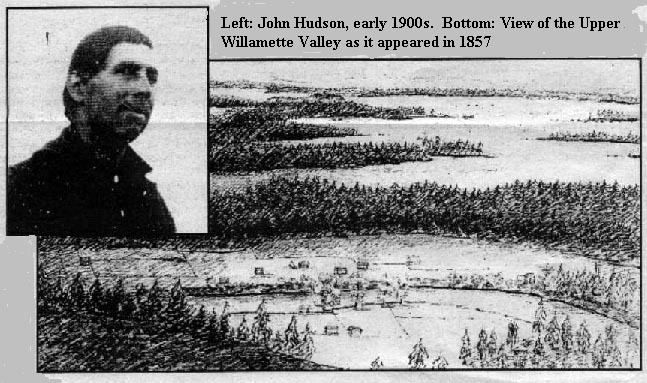 In 1869 Hudson's uncle, Santiam Chief Jo Hutchins (also known as Hudson), publicly rebuked Superintendent of Indian Affairs, Abraham Meacham, in a government recorded statement because 14 years after the treaty was signed the Grand Ronde Reservation still had no school, fences had not been built, ploughs had not been given, land deeds had not been issued and much of what tribes had received was of poor quality. "We do not see the things the treaty promised. Maybe they got lost on the way. The president is a long way off. He can't hear us. Our words get lost in the wind before they get there. Maybe his ear is small. Maybe your ears are small," declared Chief Hutchins. "Maybe you don't like my talk. I talk straight. I am not a coward. I am chief of the Santiams. You hear me now. We see your eyes; look straight. Maybe you are a good man. We will find out. Sochala tyee -- God sees you. He sees us... I am not afraid." Despite their new found material poverty, the Kalapuya and other tribes of the newly established reservation remained rich in spirit. According to one report, the Kalapuya peoples were one of the staunchest preservers of their spiritual tradition and ceremonies throughout the early twentieth century. "A long time ago these people (at Grand Ronde) always used to stand at their dance. There was a large house of theirs where they stood at their dance. They built a fire in the center of the house. Now then all who would stand at their dance danced," recalled Hudson. The traditional dancing practiced at Grand Ronde varied according to the tribal customs of those leading or hosting the event. When the Ghost Dance, which anticipated the return of traditional Indian ways of life, spread throughout Northern California, Oregon and Washington in the mid to late 1800's, some Grand Ronde members also took up the practice. But Kalapuya traditions of winter dances, Dream Power, Spirit Power quest and Shamans were also alive and well during this period. For the Kalapuya, winter dances were a way for Shamans to strengthen their personal Spirit Power. By inviting community members to dance and sing their own Spirit Power songs for five nights the Shaman would gain spiritual strength throughout the cold dark winter months. He would have a feast and sometimes give gifts to participants for sharing their powers to help strengthen his own. "Some people had a particular power that goes with a dance," according to Zenk. "Everyone had a song. You didn't talk about this power-but expressed the power by singing." Grand Ronde Elder and daughter of John Hudson, Ila Dowd, recalls that her father also had his song. "He used to be cutting wood in the shed," says Dowd. "He'd be singing a song and my mother would say,'do hear that? He's singing his song."' Spirit or Dream Power was central to Kalapuya spirituality. Individual powers might include those of an eagle, grizzly, skunk, flint arrow, carved dancing stick, dead person or thunder, according to one Tualatin account. Spirit Power determined how effective a Shaman's doctoring skills were as well as whether he was a'good' Shaman who healed and helped or a 'bad' Shaman who used his power to hurt or kill others. Seeking, finding and following ones Spirit or Dream Power was Important to many who lived the old Kalapuya way of life and it was often said illness could come to those who did not follow their power and sing their song. According to a member of the Mary's River Band interviewed in the early 1900's, seeking a Spirit Power was essential for more than just Shamans, but it was also necessary to do it properly. "Long ago we who are Indians had different ways indeed. That is how a person always was. Well now when we wanted to become a shaman or wealthy headman or hunter, they did not just become so. They would go to the hills and to the lakes that is where they got their power from," said a Mary's River Kalapuya. "Should anyone not inform the headman, if he desired merely to steal a Spirit Power, if he secretly went away to the hills, he would be killed for that. A grizzly would kill you quickly, or a wolf." Like winter dances, traditional Spirit Power quest also continued after different Kalapuya tribes came to Grand Ronde. "Youths go to (Spirit Mountain), they make their hearts good at the wall all night long and when the day rises they call out to the Dream Power," according to a Grand Ronde Tualitan who was interviewed in the late 1800s. "They are gone five nights for their hearts. They cry out after dark until the next morning. The girls too would go for their hearts. At their first menses for five days and five nights, they too wanted to see a good spirit power." How long this local practice lasted is uncertain but Dowd indicates it continued for some time. "My mother said that my father went up there (Spirit Mountain) to get a Spirit (Power). I think a lot of boys went up there," recalls the 90-yearold Elder. "I had a nephew who was always driving up there." Much has changed for the Kalapuya way of life in the last century. Today the Kalapuya peoples are actively building a new way of tribal life as part of the Confederated Tribes of Grand Ronde. With it comes the rebirth of the Grand Ronde Indian community founded on tribal efforts to rekindle and preserve Native language, culture and tradition as well as using traditions and technologies needed to manage today's economic and political landscape. Although striking a balance between old and new ways might seem contrary and difficult to some, Dowd's approach offers the life experience of 90 years. "Whatever they can find and trace back to (past ways of life) I think is OK," the Elder says. "Anything you do in sincerity I think is right for you." Grand Ronde's Cultural Resources Page: History from prehistoric times to present; gallery; a recommended web site.